In his long-awaited report on the circumstances surrounding the United Kingdom’s decision to join forces with the United States and invade Iraq in 2003, Sir John Chilcot lists a number of failings on the part of the then-British leadership. In particular, he pays close attention to the aftermath of the war and, more specifically, to the absence of proper post-invasion planning. With devastatingly forensic precision, he notes that Prime Minister Tony Blair, the relevant Cabinet Ministers and senior officials (a) were fully aware of the likelihood of post-invasion internecine violence, of the need to reconstruct the country, and of the importance of a properly constituted interim civil administration; (b) were aware of the deficiencies in the USA’s post invasion plans; (c) did not undertake proper risk assessments or consider various post-invasion options. The claim that the Coalition failed to prepare for a post-Saddam Hussein Iraq, and that its failure is a moral failure as much as a political failure, is not new. It has its roots in the deeper thought that a political actor is not morally entitled to wage war unless it does so for the sake of securing peace. If it goes to war without that ultimate aim in mind, and thus without due consideration to the aftermath of the conflict, it is guilty of waging an unjust war. The claim that war is morally justified only if it delivers peace elicits a number of difficult questions, not least of which what counts as peace. The mere absence of violence will not do, of course, for this would justify going to war with the aim of wholly annihilating or subjugating the enemy to the point where it simply could no longer react with violence. Rather, the aim of war must be a just peace. But what, then, counts as a just peace? In the just war tradition, the norms which regulate peace — or jus post bellum — are the following: victorious belligerents must aim to restore the political sovereignty and territorial integrity of their defeated enemy; some form of reparation for war-time wrongdoings should be paid to victims; assistance should be given to the defeated enemy and its civilian population towards the reconstruction of their country; and war criminals should be put on trial. Once unpacked, however, those norms raise more problems for, than offer solutions to, the conundrum of peace after war. Thus, restoring political sovereignty and territorial integrity might require the deployment of peacekeeping forces in the short term; indeed it might require a military occupation, followed by regime change under the auspices of international organisations, in order for the vanquished people to be properly sovereign. Yet the presence of foreign troops on that people’s soil, together with invasive modes of top-down governance, stand in tension with the value of political self-determination which they aim to foster. 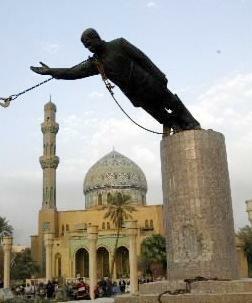 Saddam Statue by unknown U.S. military or Department of Defense employee. Public domain via Wikimedia Commons. Consider next the requirement to offer reparations to victims of war crimes. Who should pay? War criminals, presumably, and those who supported them in their endeavours. Except that, more often than not, they are dead, or cannot be identified in the chaos of war, or are too impoverished to pay up. The easiest solution would be for a belligerent community collectively to take responsibility for the crimes which its citizens and soldiers did, on its behalf, during the war. Except that, more often than not, war crimes are committed by both sides — which further complicates the calculation by which the reparations bill is settled. The requirement to assist in the reconstruction of destroyed communities, for its part, is not devoid of complications either. The Marshall Plan, whereby the United States disgorged billions of dollars towards the reconstruction of Europe after the Second World War, is the best known example of this policy. Of course, it was in the interest of the United States that European Western democracies should be strong enough to act as a bulwark against Communism. Would we want to say, however, that the United States were under a moral duty towards the Germans who had supported or at least acquiesced in Nazism and its horrors in their millions, to reconstruct their cities, renew their industry, rebuild their bridges? And even if we would want to say that, were the United States under a moral duty to prioritise helping those Germans over, for example, providing material help to the wretchedly destitute populations of sub-Saharan Africa? There is a sense of course in which the contrast between the Marshall Plan and overseas development avant l’heure is anachronistic. The main point remains, however: it is not obvious that reconstruction duties are owed to those who are in large part responsible for their suffering; and even if they are, it may not be possible to fulfill both post-war duties and duties to those who were not in any way connected to the conflict in the first instance. Consider now the requirement that war criminals be punished. What if they threaten to derail the peace process? Should we, in this case, accede to giving them an amnesty, at the cost of honoring their victims? What if there simply are too many war criminals for the judicial system to handle? Should we, in this case, resort to less formal, less Western, punitive institutions and give greater role to more traditional fora, as was done in Rwanda after the genocide? In fact, in the aftermath of civil conflicts in particular, when erstwhile enemies have no choice but to live side by side, reconciliation rather than, or at least alongside, punishment might be morally preferable — to the extent that its constitutive institutions and practices, such as truth commissions and official apologies help to foster trust and rekindle hope. Finally, there is an important dimension to peace after war which we tend to overlook, at least in the relevant philosophical writings, and yet which is crucial, it seems to me, to the restoration, or instauration, of good relationships between belligerents —namely, the commemoration of the conflict and of those who suffered and died in it. When we erect monuments and crosses for combatants who died in war, lay wreaths in their memory, put up commemorative plaques for murdered civilians, turn battlefields into places to visit and build military museums, we typically mean to remember something about ‘us’, as distinct from ‘them’, our erstwhile enemy. In so doing, we run the risk of aggrandising our suffering and minimising theirs. Therein perhaps lies the greatest danger for peace. Featured image: Stone monument by MichaelGaida. Public domain via Pixabay. Cécile Fabre is Senior Research Fellow at All Souls College, and Professor of Political Philosophy at the University of Oxford. She has written extensively on theories of distributive justice, democracy, the rights we have over our own body, and the morality of war and peace. She has published four research monographs with OUP (Social Rights under the Constitution (2000), Whose Body it is Anyway? 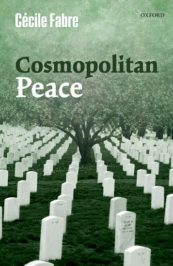 (2006), Cosmopolitan War (2012), Cosmopolitan Peace (2016).